MIT News reviewed MIT Graphics Group's article presented last week at IEEE Conference on Computer Vision in Kyoto, Japan. The idea is that given enough time, a digital camera could take a dozen photos with different focus distance and software could stitch them into a perfectly focused composite. For the time being, however, the technique is limited by the speed of camera sensors. So, the group described alternative approach based on "lattice-focal lens," an ordinary lens filter with what look like 12 tiny boxes of different heights clustered at its center. Each box is in fact a lens with a different focal length, which projects an image onto a different part of the camera's sensor. The raw image would look like gobbledygook, but the same type of algorithm that can combine multiple exposures into a coherent composite can also recover a regular photo from the raw image. More details and articles can be found on Sam Hasinoff page. "On July 10, 2009, the company sold a 65% interest in Aptina Imaging Corporation (“Aptina”), a wholly-owned subsidiary of the company and a significant component of its Imaging segment, to Riverwood Capital (“Riverwood”) and TPG Capital (“TPG”). Under the agreement, the company received approximately $35 million in cash and retained a 35% minority stake in Aptina and Riverwood and TPG contributed significant debt-free capital to the independent, privately-held, company. In connection therewith, in the third quarter of fiscal 2009, the company recorded a charge of $53 million, the estimated loss on the transaction, to write down certain Aptina intangible assets and property, plant and equipment to their estimated fair values. The company’s results of operations for the fourth quarter of fiscal 2009 include a credit of $12 million to adjust the estimated loss to the final loss of $41 million. The company will account for its interest in Aptina under the equity method and will continue to manufacture products for Aptina under a wafer supply agreement." Digitimes: Xintec and Visera chairman, Shang-Yi Chiang is getting back to TSMC as senior VP R&D. In the past Shang-Yi Chiang used to be TSMC's VP R&D, overseeing image sensor development, among many other things. Update: EETimes adds few more details on Shang-Yi decisions to go from VP R&D to chairman and then back. Yahoo: OmniVision announced that its ultra small OV6920 medical image sensor has been selected for ETView's new TVT Tracheoscopic Ventilation Tube. The OV6920 is among the world's smallest available NTSC CMOS image sensors based on 2.5um pixels, enabling TVT camera outer diameter of just 4mm. EETimes: Jova presents its new image sensor and module tester. The new ISL-3200 tester sells for as $9,995 in volume and supports up to 64MP resolution at 100MHz pixel rate. MIPI/SMIA interfaces are supported through an adapter board. The new system represents the next generation of Jova's benchtop testers. The company customers include Aurora Optical, Boston Scientific, ExBiblio, HP, Imaging Works, MFlex, NASA, NoblePeak, OmniVision, Palm, Siimpel, TSMC, Tessera and Vista Point Technologies (Flextronics). Yahoo: New Research and Markets report finds that the Taiwanese camera module industry's shipment continued to be affected by the global mobile phone market decline in the first half of 2009, with shipment falling year-on-year. In 2009, CCM shipments are expected to see year-on-year growth, as the global economy is starting to show signs of recovery and the emerging market demand is increasing. At IBC2009, JVC provides a live demonstration of its KY-F4000 real-time 4K camera. Live 60p images from the KY-F4000 will be displayed on JVC’s new 56-inch LCD panel with 4K resolution in the Production Village area of IBC. This compact camera features a single 1.25-inch CMOS image sensor of 3840 x 2160 pixels, capable of producing live images with 4 times the resolution of full HD. JVC is currently shipping a 4K D-ILA projector, the DLA-SH4K. The addition of a 4K camera and 4K LCD monitor brings full capture capability and further display options to its product line. Xbit Labs: At Tokyo Games Show Microsoft said that its forthcoming 3D image-sensing Natal device is supported by 14 major developers of video games. Among them are Activision Blizzard, Bethesda Softworks, Capcom, Disney Interactive, Electronic Arts, Konami, MTV Games, Namco Bandai, Sega, Square Enix, THQ, Ubisoft and, of course, Microsoft Game Studios. Developers who received development kits from Microsoft in early June, used the opening of the Tokyo Game Show to voice their excitement about the device. Microsoft Project Natal device combines an RGB camera, depth sensor, multi-array microphone and custom processor. The depth sensor, which is an infrared projector combined with a monochrome CMOS sensor, allows Natal to see the room in 3D under any lighting conditions. Update: Project Natal FAQ gives a lot more details, both technical and business. Tech-On: Shanghai-based Hua Hong NEC announced production of CMOS image sensor in its 0.162µm process (CIS162). The 4T pixel process is derived from HH NEC standard 0.162µm logic process. The foundry is said to cooperate with its key customer to develop the CIS162 process with a 1.8V core device and 3.3V I/O circuits. Galaxycore is rumored to be HH NEC's key customer [ISW]. Digitimes: Samsung is sampling HD image sensors. The company expects HD and full HD sensors to enjoy significant growth in 2010. The penetration rate of 1.3MP sensors (both HD and non-HD) used in notebooks will increase to 43% in 2010 from 30% in 2009, and 2MP or above full-HD sensors will increase to 21% from 13%, according to Samsung. The Business Insider: Morgan Keegan upgraded OmniVision Technologies Inc. on Monday to its highest rating, saying the chip maker is taking market share from Aptina and is on track to increase profitability. Upgrades to image sensors in smartphones and laptops will improve profit margins, and the company has opportunities in the auto sector as well. Yahoo: In the meantime, Omnivision announced that its AutoVision image sensors have been selected by Altek, a Taiwanese imaging systems provider. Altek chose OmniVision's sensors for its Eagle View 360 degree surround viewer and lane departure warning system (LDWS), two of the automotive industry's most sought after driver assistance applications. Altek's Eagle View system is already being implemented by a large Asian automotive OEM. Market Watch: Samsung announced its newest quarter-inch optical format, 5MP SoC image sensor, the S5K4EA at the sixth annual Samsung Mobile Solutions Forum held in Taipei, Taiwan. Samsung’s proprietary pixel technology, the Samsung Enhanced Energy Steering (SEES) is said to bring more light into its 1.4um pixel. No word on BSI is said, so it's probably FSI sensor. The S5K4EA imager has regionally adaptive DR expansion to brighten shadowed areas of a picture and is said to "intensify the clarity of brighter regions". Its fast frame capture with anti-shaking control feature enables sharp pictures by reducing blur caused by jitter from unsteady hands. The sensor is capable of processing 1080p resolution images at 30fps. Samsung’s S5K4EA also offers auto focus, Xenon flash, mechanical or electronic rolling shutter. The new imager has a YUV output interface over MIPI2 or parallel. It also has JPEG with thumbnail output to speed up picture browsing on the phone. The S5K4EA imager is available in an auto focus 8.5x8.5x6mm or smaller module. Samples are currently available with mass production slated for the first quarter of 2010. Digitimes reports that the price of image sensors and controller ICs used in notebook cameras in 2009 is likely to drop 3-4% on quarter and 17-18% on year due to increased penetration of notebook cameras. Notebook image sensors prices dropped 5-10% each quarter in 2008, while controller IC prices declined by 5-10%, with an ASP of US$0.70-0.75. The price of notebook camera related ICs dropped 10% in the first quarter of 2009, according to Digitimes sources. Yahoo: Omnivision introduced OV2715 - a 1080p 30fps HD image sensor optimized for the mainstream IP camera and HD closed circuit television (HDcctv) markets. The 1/3-inch OV2715 is built on a 3um zero CRA OmniPixel3-HS pixel, delivering low-light performance of 3300 mV/(lux-sec) and a peak dynamic range of 69dB. The OV2715 is currently available for sampling with mass production scheduled to start in the Q4 2009. Reuters quotes Robert W. Baird analyst Tristan Gerra saying "Our checks indicate the new iPod nano will feature an OmniVision VGA sensor". He expects the average selling price for this chip at 20 cents, compared with an estimate of $1.50-$1.60 for a 2MP sensor in the iPod touch. Gerra predicts: "Automotive is going to be an avenue of growth. But still, for the next couple of years, I think cellphone is going to be what matters the most for companies like OmniVision or Aptina". EE Herald: e2v has introduced the EV76C560, a new high-sensitivity 1.3MP CMOS image sensor that is suitable for industrial machine vision, barcode reading/scanners, surveillance and other imaging applications. The 1280 x 1024 imager comprises 5.3µm pixels with a unique architecture that assures high efficiency global shuttering (3000:1) while maintaining better quantum efficiency (QE). It outputs full resolution images in a 10bit parallel format at 60 frames per second. 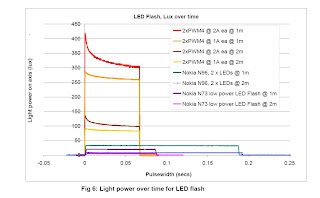 Rolling shutter mode, users can optimise the signal to noise ratio (SNR) performance against available lighting and scene motion content capture requirements. The samples are available now. Can Stand-Alone ISP Business Be Profitable? Zoran is rumored to have stopped development of its APPROACH series of mobile processors and laid off the team. The company is still continuing with its COACH processors for DSCs. Nethra Imaging is rumored to change its business model, abandons general ISP market and is going to pursue niche opportunities. I put all of them in the same basket, even though many would disagree. There are significant differences between the companies: some of them are purely ISP vendors, while others integrate many more features together with ISP. Still, to me this is the indication that stand-alone ISP, either as silicon product or IP block is not an attractive business model anymore. Mtekvision remains profitable over recent years. However, I'm not sure if its in-camera ISP business is still profitable. Silicon Image has some limited success, mainly selling ISP IP to baseband processor vendors. Core Logic appears to use its ISP knowledge in multi-function application processors. I do not think it produces stand-alone ISP anymore. Spiral Gateway announced a disruptive ISP technology. Looking at others, it might be not that easy to sell these days. So, it looks like stand-alone ISP market which was quite crowded just few years ago, becomes almost empty now. All the ISPs are integrated either onto sensor SoCs, or onto application processors, camera control processors, baseband processors or somewhere else. Sounds obvious now, but few years ago there were claims that a really good ISP is too big to be integrated. It appears those claims were wrong. Omnivision has its TrueFocus implemented on the separate chip, together with other ISP functions. Sony ISP supports high speed features. I believe it will not be needed once application and baseband processors integrated ISPs become faster. ST ISP family - I'm not sure why ST does not integrate them. One of ST ISPs has DxO EDOF integrated. Fujitsu Milbeaut ISP family is actively developed. Digitimes: HD image sensor competition between Aptina, Samsung and OmniVision is expected to lower prices and boost demand from camcorder and notebook applications in 2010. Aptina was the first to kick off HD sensor production, Samsung started such production in July 2009 and OmniVision will do so in September 2009. Digitimes: Taiwan-based IC distributor Sunnic Technology & Merchandise saw revenues at the highest level in three years, driven by increased orders for Sony's CCDs, according to the company. Sony product lines account for more than 50% of Sunnic's total revenues, with CCD image sensors being the major products. "We proposed the constant-light-diffraction-scaling methodology in order to design the CMOS image sensor(CIS). We developed a high performance guideline, and verified it using CISs with various pixel pitches and number of metal wiring layers. Using this guideline, we realized the first ever successful fabrication of 1.12 and 0.9um pitch CISs." Abert Theuwissen, as a Chair of the ISSCC 2010 Technical Program Committee, talks about imaging content on the upcoming conference. There is going to be a plenary talk by Tomoyuki Suzuki, VP of Sony, named “Challenges of Image Sensor Development” with a lot of interesting historical and contemporary stuff. There is also one-day forum on High-Speed Image Sensor Technologies - a hot trend in CMOS imaging, and much more. As a matter of fact, Albert's blog has a lot of interesting articles on different areas in image sensors. I have not followed it for a while and missed a lot, as I see now. There is an interesting discussion in LinkedIn CCD/CMOS Image Sensor group on sensor and camera testing procedures. It mentions two on-line documents explaining the camera and sensor performance parameters: EMVA1288 Standard and Basler camera quality paper. With quite a few Q&A sessions running in parallel, the two LinkedIn image sensor groups are becoming the nice places for on-line discussions. Update: One more image sensor metrics explanation in the above discussion thread is AWAIBA presentation. Semiconductor International published Chipworks article talking about how HD video feature affected DSLR sensor design. 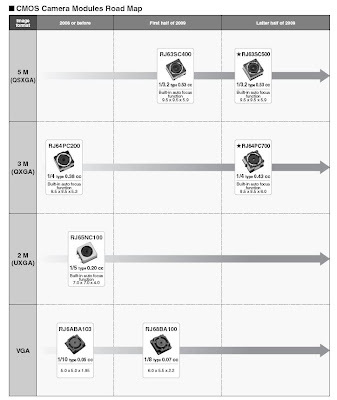 The article analyzes quite significant changes in Samsung sensors used in Pentax K-7 (HD) and K20D (non-HD) and Panasonic DMC-GH1 (HD) and DMC-G1 (non-HD) sensors. Chipworks also mentions that Nikon uses its own designed sensors in its recent DSLRs, rather than outsource them to Sony. Canon DSLR sensors are said to be very stable design-wise and have little evolution over the last 3 years, with most performance improvement possibly coming from the Digic ISPs. Update: Chipworks blog has an expanded version of the article. Anteryon was able to raise $10M from Mentha Capital and BNP Paribas Private Equity. Mentha Capital is a new investor; BNP Paribas Private Equity already invested in Anteryon in December 2008. Anteryon‘s main product is WaferOptics micro-optics for camera modules, LEDs and VCSELs. The company's WaferOptics product portfolio ranges from VGA to 5MP. Anteryon’s manufacturing facilities in Eindhoven and China today produce millions of WaferOptics lens stacks monthly at extremely high yield, for several tier 1 mobile phone manufacturers around the globe. With the newly invested capital Anteryon plans to boost its worldwide manufacturing facilities, including extension of the facilities in Eindhoven, Netherlands and the set up of a new production facility in the Far East. So, in spite of the claims to the contrary, VC market is alive and interested in investing even in such cost-sensitive projects as low-end sensors manufacturing. Yahoo: New Aptina CEO David Orton appointed Greg Helton as President and Managing Director of Aptina Japan. Prior to joining Aptina Greg Helton was President of Fairchild Semiconductor Japan since 2002. Before Fairchild, Helton ran LSI Logic's Japanese subsidiary as president of LSI Logic Japan. Previous experience included senior management positions with VLSI Technology and National Semiconductor. Helton is a graduate of California Polytechnic State University at San Luis Obispo, from which he earned bachelor's and master's degrees in electrical engineering. Digitimes sources inform that OmniVision has recently notified some customers that it may not be able to meet their demand for October, as orders from OEM notebook makers and terminal device makers are stronger than expected. Supply from Aptina is also tight, especially for the 1.3MP product A380 - a strange name, not in Aptina catalog. Yahoo: Kodak full-frame KAF-18500 CCD was developed specifically for the newly announced LEICA M9, the latest member in Leica’s legendary M-series of cameras. 18MP KAF-18500 features offset microlenses to improve performance at the edges. In addition, the sensor incorporates a new IR-absorbing cover glass as well as a new red color pigment for improved color fidelity and improved image quality. 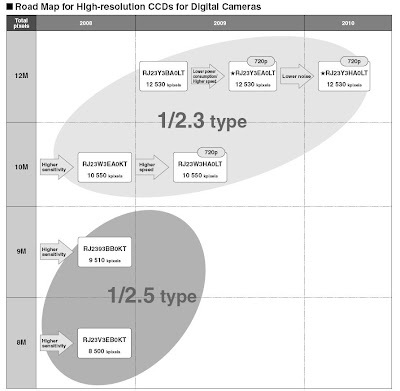 Update: Kodak's Plugged-In blog adds few details on the new CCD design trade-offs. "Sony, for example, claims a gain of 8 dB in sensitivity, with 6 dB of that due to better quantum efficiency and 2 dB due to lower SNR. So, back illumination is taking off." "Tessera estimates that even allowing for economics of scale (more die per wafer), mass-produced back-illuminated die will cost twice to four times as much as front-illuminated die with similar resolution. Yet the payoff is what is estimated as five times improvement in performance overall." "Sony has also seen success with backside illumination. It has produced a 5-Mpixel device on a 1.75-µm process for mobile phones, digital cameras, and camcorders." If true, this might be a new sensor that I have never seen an announcement of. The sensor that Sony uses in its Exmor-R camcorders has 6.6MP resolution, while its BSI sensor for still cameras announced in August is 10.2MP. Image Sensor Blog from Japan refers to Tech-On article in Japanese saying that Samsung plans to start BSI sensors mass production sometime in 2010. The first Samsung BSI product is supposed to be 14.6MP sensor delivering 30fps speed. The sensor is based on low-cost bulk Si process. The sensor is targeted to digital cameras, camcorders and high end camera phones. No data on its pixel size is given. At 1.4um pixel node BSI technology is said to improve sensitivity by 30% as compared with FSI. The article also has a nice CMOS sensor market pie with Omnivision holding 26% share, Aptina-18%, Samsung-17%, SETi-7% (surprise! ), ST-6% and Sony-4%. Tech-On: NEC and the National Institute of Information & Communications Technology (NICT) of Japan have jointly developed a portable camera with improved sensitivity to terahertz radiation. The camera is based on QVGA bolometric sensor. The sensitivity improvements are based on the new lens material and adding what appears like a resonant dipole on top of each bolometric pixel. A quantum cascade laser is used for the scene illumination. Unfortunately, the article does not show pictures from the camera. I would love to see how the world looks in 3THz band. Financial Times' Chris Nuttall reveals Natal plans. Microsoft's Natal gesture interface might or might not be the next big market for image sensors, as it's promised to become the universal "remote control" for everything: game consoles, TVs, monitors, media centers, mobile phones and what's not. Primesense is said to use CMOS sensor and put an infra-red bar code out into the room allowing a second camera to detect the spaces between the lines of the barcode, determining how far away each part of the image is. By barcode FT probably means structured light. So, it looks like Primesense technology is used now, while 3DV time-of-flight is the future direction. And Canesta is another time-of-flight contender. FT says that no one expects to see the Project Natal product on sale to consumers until the holiday season of 2010. Chipworks announced Omnivision OV5642 ¼-inch, 5 Mp, 1.4 µm pixel BSI sensor process and circuit reverse engineering reports. Also, the new Fujifilm 12MP Super CCD EXR report is ready. As Mitch Reifel reports in Linked-In CMOS/CCD Image Sensor Group discussions, Kodak has shuttered its CMOS sensor group. The group was the home of many technological innovations. Unfortunately the nice ideas have not translated into the market success. Sad story. Another layoff story brought to my attention is Cypress/Fillfactory site layoffs. My understanding is that a significant part of Filfactory staff has been let go. Formerly I wrote that Fillfactory is profitable inside Cypress - it looks like I was grossly wrong. Another sad story. Update: Kodak CIS group layoffs message disappeared from the Linked-In group. Still, Kodak layoffs are real, confirmed by other sources. Update #2: The validity of information about Cypress/Fillfactory layoffs is questioned in comments. Till the official confirmation one should see it as an unconfirmed rumor. Digitimes: Pixart is expected to see its revenues for Q3 2009 grow at a sequential rate higher than the 30% it projected earlier due to increasing demand for its optical touch panel solutions from the PC segment, according to Digitimes sources. Pixart is Quanta Computer's sole supplier of optical touch solutions used in all-in-one PCs and notebooks and it began shipping to Quanta earlier this quarter. The company expects to sign more customers in the optical touch sector beginning in 2010, the sources added.